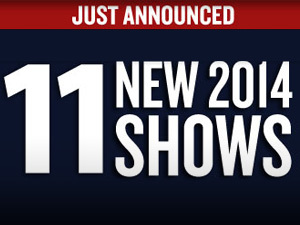 Home > News > News > WOW – Lots More Great Shows in 2014! WOW – Lots More Great Shows in 2014! Nine-time Grammy winner Sheryl Crow is an accomplished singer/songwriter and skillful guitarist. Her music puts an updated spin on classic rock sounds, incorporating folk, hip hop, country and pop. “All I Wanna Do,” “Good is Good,” “Soak Up the Sun,” “Always on Your Side,” and “The First Cut is the Deepest” are some of Sheryl Crow’s many hits. Faith and passion have always been the bedrock of contemporary Christian rockers THIRD DAY. During nearly 20 years in the spotlight, THIRD DAY has earned four Grammy and 24 Dove Awards. “Show Me Your Glory,” “I Believe,” “Call My Name,” “Born Again,” and “Trust in Jesus” are just a handful of the THIRD DAY hits that inspire and uplift audiences. Jackie Evancho’s first performance on America’s Got Talent left audiences astonished that such a beautiful voice could come from a 10-year-old. Now 13, the young soprano’s understanding of classical phrasing and perfect pitch allow her to tackle difficult music – everything from Puccini to pop. Jackie will be accompanied by a 28-piece orchestra. With his laid-back, straightforward vocals, country singer/songwriter Don Williams has 17 #1 hits to his credit, including “Stay Young,” “Lord, I Hope this Day is Good,” “Some Broken Hearts Never Mend,” “If Hollywood Don’t Need You (Honey, I Still Do,)” and “Tulsa Time.” Spend an evening with this Country Music Hall of Fame inductee. Acclaimed TV late night show host, Jay Leno, is an admired stand-up comedian, best-selling children’s book author, much-in-demand corporate speaker, lovable TV and movie voice-over artist, pioneering car builder, philanthropist, and Emmy Award winner. Leno spent more than two decades as host of The Tonight Show with Jay Leno. Frankie Avalon, Fabian, and Bobby Rydell return to AMT as the Golden Boys. Join us for a night of nostalgic hits such as “De De Dinah,” “Venus,” “Bobbysocks to Stockings,” “A Boy Without a Girl,” “Turn Me Loose,” “Tiger,” “Volare,” “Wild One,” “We Got Love,” “Kissin’ Time,” and “Forget Him.” This show is sure to bring back many a teenage memory!